With this handy adapter, you can enjoy many benefits brought by an add-on monitor. The most obvious one is that you get more desktop area to have more applications visible at one time. For example, you may work on one monitor while your family watch video on the other. No more stacking windows within the confines of a single display. Or you may span an application, e.g. spreadsheets, across two displays. What's more, the adapter is hot pluggable. If you are not using the extra monitor, just unplug the adapter at any time; no reboot needed. Edit on one screen while surfing the Internet information on the other. Do multiple screen presentations without bringing another computer. Easily provide multiple screen exhibitions in a trade show. Use second display for palettes/tools. Get a panoramic view of large documents. Type documents on one screen while viewing reference material on the other. Compare two documents simultaneously across two screens. Have one monitor per data stream. Get additional perspectives when playing games. 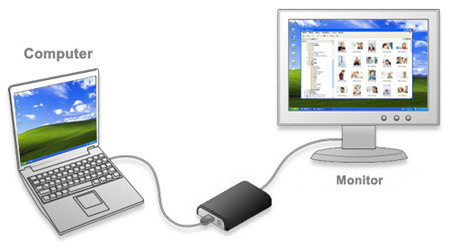 Add-on monitor, LCD or projector through a single USB 2.0 port. 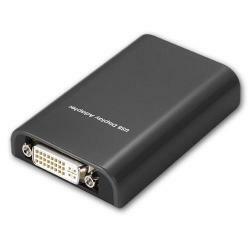 Supports up to 2 USB display adapters to work simultaneously. Hot-plug; add or remove monitor without system reboot. Resumes from hibernation and suspend modes. System must have a CPU at 1.2GHz or higher processor clock. Intel Pentium/Celeron family, or AMD K6/Athlon/Duron family, or compatible processor. At least one USB2.0 port. 30Mb of available disk space.